Red White Blue Dessert - Health Nut Turns 2. 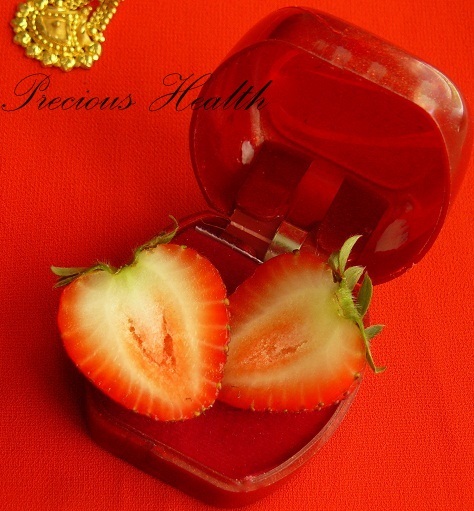 Health is as precious as any priced jewelry,needs to guarded with the same sense of responsibility. What started as a hobby of leisure time has now become an inseparable part of my routine.Food blogging indeed has brought out the best of my culinary skills.I owe it all to the viewers for the encouragement and support that has given me the confidence each time to bring out more of the tried and tested healthy recipes. For a sweet celebration of blog birthday and the Independence day,I couldn't think of a simpler fruit and cream dessert. As an immigrant I had little knowledge about American history.That has changed recently with my new found interest in nation's past,partly due to my 7 year old's keen interest in reading the biographies of the founding fathers of the nation.He has this knack of memorizing names and numbers,amazingly he could memorize the list of all the presidents.Picked his favorite as Abraham Lincoln,for the big change he brought with the abolition in slavery.I couldn't be more impressed.And his opinion about this dessert in patriotic colors was simply amazing. As long as one takes care of two important points,first the gelling agents agar-agar(the vegan replacement for gelatin available in most Asian stores) or gelatin be fully dissolved in the liquid and second giving ample time for one layer to set before building another over it,there is little that can go wrong with this delicate dessert..
Start with making the coconut jelly layer,heat the water in a saucepan and add the agar-agar or gelatin,let dissolve completely,about 3-4 minutes.You don't want any lumps in the jelly,so be sure its totally mixed in.Add the coconut milk and simmer for 3-4 minutes.Pour in in individual ramekins or other ceramic bowls(about 3 inches in diameter) until 1/3rd full and let set in fridge for 2-3 hours until completely stabilized. Now prepare the blueberry jelly layer similarly,heat the water in a saucepan and add the agar-agar or gelatin,let dissolve completely,about 3-4 minutes.Add the blueberries and let cook for 2-3 minutes until soft.Blend the mixture until smooth.Make sure the coconut jelly layer is completely set,now pour the blueberry mixture over.Set in fridge for another hour or two until set. Prepare the sauce,by cooking the berries with water and sugar,until soft about 3-4 minutes.Mix in the agave towards the end.Blend smooth and cool. To unmold,use a knife and carefully run around the ramekins to loosen the edges of the dessert and slowly flip in to a serving plate.Enjoy chilled with red raspberry strawberry sauce and more fresh berries. Congratulations on two years of blogging!! All the best for your next milestone!! And Enjoy your long weekend too!! Congrats Yas on completion of two years in this bloggy world. Love to see many more healthy recipes from you..RWB dessert looks yum and you have clicked it so beautifully..
Hi Yasmeen, congrats dear and must say you have come a long way in an extremely healthy manner. All the luck for your future journey. Congratulations Yasmeen, you have achieved a lot in this two years with so many delicious and healthy recipes. Your kid is so adorable. My best wishes and blessings to him. This dessert definitely brings out the patriotic feeling..
And Congratulations on your blog anniversary. Wishing you more n more of this. Congrats Yasmeen!Excellent recipe...Iam drolling over the pictures...too gud. You have done wonders in the blogging world.Keep rocking! So adorable, love the desserts! Happy blog anniversary. Congrats on completing two successful years. I can't take my eyes off from the dessert. Lovely colors. 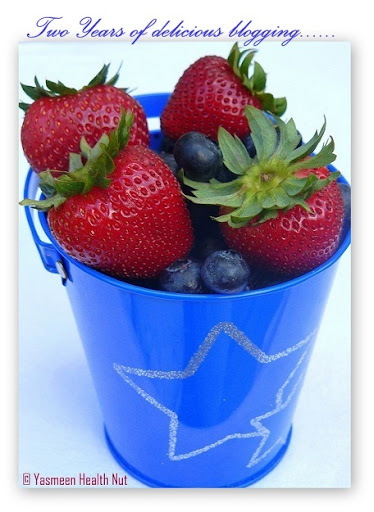 Happy Blogiversarry and 4th of July! That is one delicate tasting and wonderful dessert! Happy anniversy and independence day. Red white blue dessert looks really yumm. Congratulations Yasmeen on turning 2. What a mouth watering presentation. Congrats on turning two. U know I love your blog very very much,right? I want you to keep up your fabulous job and post many healthy mouth-watering dishes. 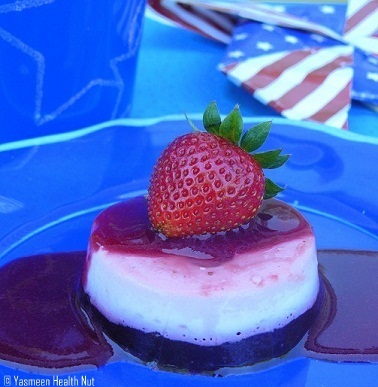 Lovely dessert, perfect for 4th of July. Congrats on two years babe! You rock. I always love coming here to read your recipes and the stories that go along with them! Happy 2nd anniversary.Wishing you many more rich nad wonderful blogging years ahead. This dessert is so pretty and looks devine. Happy birthday to Health Nut Yas, wishing u many more beautiful years in this blogsphere...RWB dessert looks utterly delicious and beautiful.. Happy Birthday HealthNut.It was a healthy 2 years of blogging Yasmeen.I learned so many things from you.Keep up the good job. congrats yasmeen......thuoght u were here for longer than that!! !you have so much of fame cos of the beauty of ur blog....in all sense...content,outlook,recipes,structure....etc...we love having u around....keep up the good work sister. by the way,that dessert looks divine! Hi there, thanks for the comment. Beautiful pictures! This looks wonderful! Perfect weekend holiday treat. You have a wonderful blog here! Happy blog birthday.Must be a proud achievement. Hey Yasmin, thanks for visiting my blog! Loved your dessert.will try it in Canadian colors! What a lovely way to let us new followers of your culinary journey know of your years of passionate dedication. Your dessert looks refreshingly lovely. Thank you for sharing your joy for blogging. Congrats! What a colourful treat for the 4th of July! Happy 2 years of blogging! Your dessert looks so scrumptious. Have another great year of blogging! Happy 4th! This is a great blog is very important to use any method to informer about health care .Look this: "We Need More Health"
Congratulation on completing 2 years!! Dessert looks yummy! congrats yasmeen and many more years of cooking and blogging.nice dessert to celebrate with! Congrats Yasmeen...love to see more and more healthy recipes..dessert looks fabulous..beautiful clicks. Congrats on your blog Birthday dear. This is certainly an amazing way to celebrate the July 4th.Dessert looks tempting. Enjoyed reading about the child's memory power n enthusiasm. Happy blogging and achieve more Yasmeen. 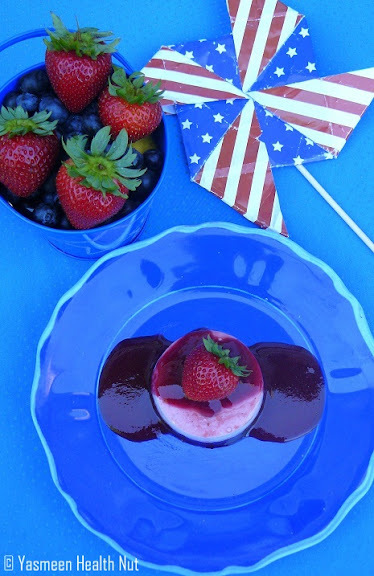 Happy Birthday to your blog, love the 4th of july themed dessert as well! Happy blog anniversary! The dessert looks gorgeous! What a simple yet delicious dessert! It looks perfect for the the 4th. Congrats on your second birthday, I love your blog and can't wait to see what you do with year three! you just turned 2, I can't believe it! !, you have made an amazing job with your blogging yasmeen, keep it up! !, keep posting more recipes and wonderful mouthwatering clicks!! Ooops dessert looks great with a great click too!! Woohoooo Health Nut Turns 2! Congrats!!!! A delicate and delicious dessert.Good job on the milestone achievement. Many Many congrats! Hope you continue with your healthy blogging spirit for many more years. A beautiful dessert.Wish many more years of good blogging. How fun! I wish I had found this blog in time for my 4th of July celebrations. This is the most wonderful blog for healthy (and fun, and beautiful appearing) recipies I've ever seen. Thanks Yasmeen! Congratulations on completing your 2nd year of successful blog journey.Wish to see many more blog years of celebrations with healthy and delicious recipes from you.